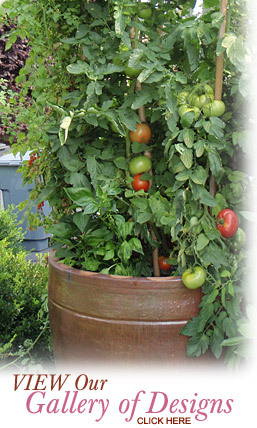 Do you love fresh, organic produce, but just don't have the time or the green thumb to grow it yourself? Would you love to walk out your kitchen door into a lush and productive backyard garden, filled with yummy and flavorful produce? Let The Gilded Lily plant your garden for you! You can enjoy seasonal crops like lettuce, spinach, broccoli and radishes, along with highly anticipated Summer fruits like tomatoes, peppers, cucumbers, and eggplant. 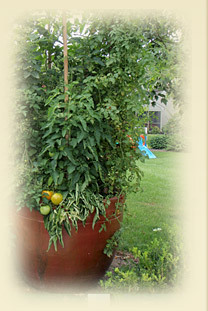 We specialize in heirloom varieties of tomatoes, cucumbers, eggplant and many more. Ready to expand your culinary talents? Fresh, organic herbs will help spice up your dishes like never before! The Gilded Lily can plant a wide range of fresh organic herbs to tempt your palate and surprise your family. Nothing is quite as wonderful as picking fresh basil, chives, rosemary, thyme and more right from your own backyard garden! The Gilded Lily can grow vegetables and herbs for you in decorative containers, raised beds, or large scale “in-ground” gardens. The possibilities for fresh and healthy produce are unlimited. It's the GREEN way to live in luxury style! Contact us today at 575-8567 for more information on getting your backyard garden going this season!